By all rights this should be called bittersweet tea because it's coarser and less refined than I expected it to be. 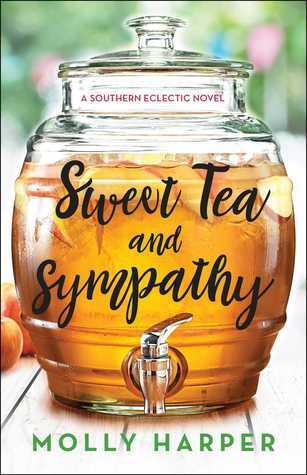 The main character, Molly, has a career-ending experience involving shrimp and flamingos and has to retreat to her father's family compound to work at the bait shop and funeral home. She hasn't seen her father or his family since she was a young child. Her mother left because her father was a drunk and she was raised by her cold mother and her equally cold stepfather. Say what you will about her father's family, they're not cold. Being chick lit, of course the family is equal parts charming and maniacal but at least the author was respectful of the Southern setting and didn't show them as a bunch of backwoods hicks. These are intelligent business people who are as smart as they are sassy. The love interest, because you can't expect there not to be one, is a well-rounded character with more sides to him that hot hunk. He's a widower and father of two young girls and I liked the romance that developed between them. I liked the kids but thought the youngest one was a little too precocious to be real. I loved her name, Juniper. In fact, I could see having a dog named Juniper someday. That's cute. The book felt a little darker, a little coarser, and a little more realistic than I was expecting. It helps to remember that it's not a romance, it's chick lit, and there is a difference. Yes, there is a romance, but it's not about the happily ever after so much as it is about the main character finding solace and healing for the holes in her heart from an unhappy childhood. The way the author wrote it was more realistic than not, but I wanted a touch more magic - a touch more optimism. I had a problem, by the way, with the treatment of dogs by the narrative. They're not mistreated by the characters but they are treated as a plot device and not a great one. It's hard to explain but it felt like it was written by someone who doesn't like dogs but felt she needed them for the story. I did love the small town politics, though. That was the most fun part of the entire book. I give it four stars - it's a good read, but don't expect magic.